What better way to welcome children than through good morning songs! These are good morning and welcome songs that are sure to bring smiles to everyone’s faces and to start the day off on the right foot. 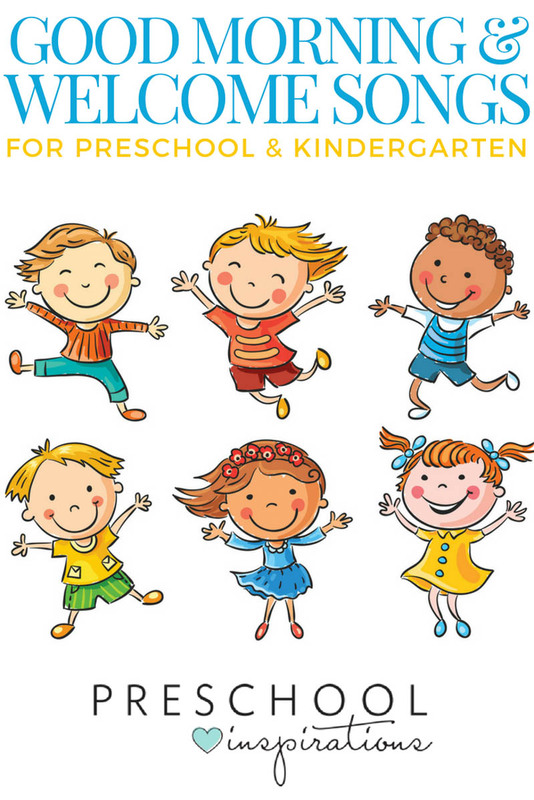 We have some favorite hello songs that I will link to at the bottom of the post for even more awesome songs to include in a circle time or small group setting! 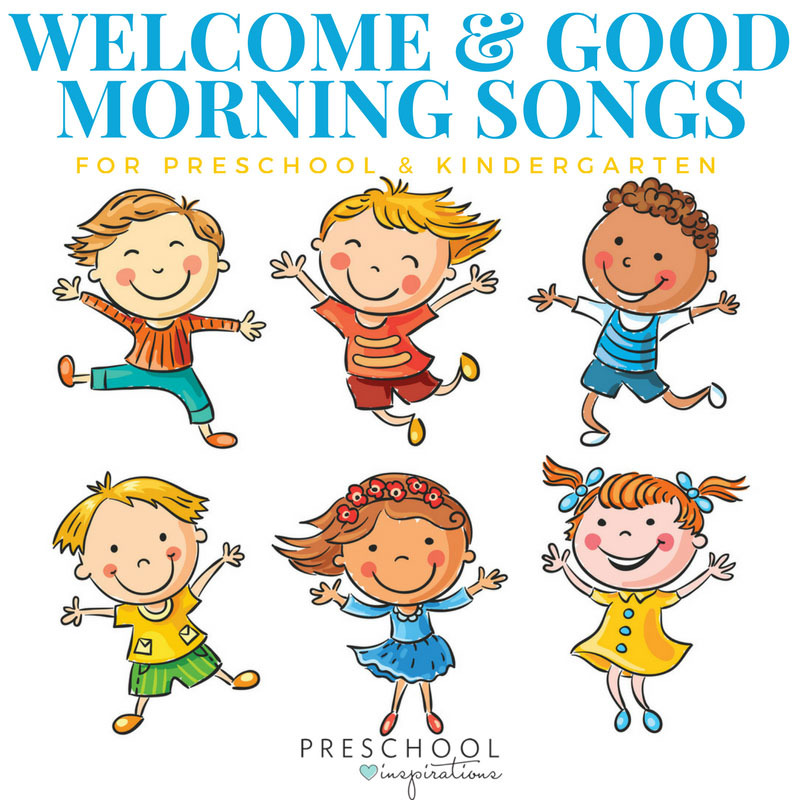 Good morning songs and welcome songs can be used in the classroom, for a library storytime, in a church setting, or any other place where a group of children are gathered. It’s a great way to help children settle in and start to feel comfortable and welcomed to the group. Plus, these songs should keep them on the edge of their seat and become interested in the group too! You’re truly missing out if you don’t include some in your preschool curriculum. Some of these songs are available for purchase or include a free printable, and I have put the links in so that you can grab a copy of the song. Allie from No Time for Flashcards came up with this great circle time chant! You can even get the free circle time chant printable with the words and some extra tips on singing it and doing it with children! You may have seen Ms. Humphrey’s, from Teaching and So Fourth, and her fourth-grade class doing their welcome routine on Facebook! She took a common song her class loved and adapted it for her own class. So smart! Apparently, welcome songs work with older kids too! This is a great class video from Teach Preschool singing one of our favorites from Music with Nancy Kopman! If you’ve been teaching for a long time, you may have heard this one before! Get the lyrics and read more about it over at No Time for Flashcards! The Kiboomers have some of our favorite songs, and this Good Morning one is absolutely perfect for starting off the day! This calming morning song is a great one to add to your morning routine! Need a morning action song? This one is super fun and to the tune of La Cucaracha. This good morning song is a classic and one that I remember from ages ago! This simple and catchy good morning song has lots of repetition and sunshine! My friend Jodie over from Growing Book by Book shares on of her favorite morning songs that names each child and has a literacy element at the same time! You can even get a printable version of her Good Morning Circle Time song! This sweet good morning song is simple to learn and will make you want to dance and get started for the day! This good morning song is great to implement with lots of stretches and movements! Need some more great songs for circle time? Try these! I am a teacher in Georgia looking for any kind of Great Stimulating Resources and or Lesson Plans you can lend me. I know how to Tweak if needed….